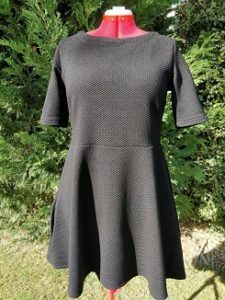 In this intermediate class we will learn how to handle stretch materials and create super comfortable stretch dress that you can dress up or down and wear all year round. This design is highly customisable to your taste. 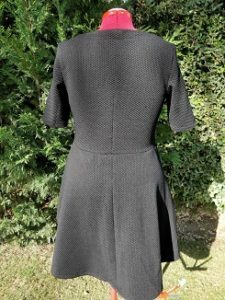 You can choose the length of the sleeves, add/remove pockets and create this perfectly fitted dress that you will keep going back to. Note: The pattern is available in following sizes: Your actual bust measurement (widest part of your chest) up to 120cm (47 in.). If your measurements fall outside of this, please contact us before booking your class. Stretch fabric & inserting sleeves- moving from cotton fabrics, that are relatively easy to sew without much movement, to more unpredictable stretch is a big step in any sewist's skill building. Once you know how to handle stretch materials you can embark on amazing journey of creating t-shirts, jumpers, stretch dresses and much more. Second key skill in this class is inserting sleeves. We will show you a full proof method of having pucker free sleeves every time. In order to complete this project you will need 2 m (fabric width of 125 cm = 49 in. or wider)of heavier stretch knit material (e.g. textured surface stretch jersey knit), matching thread (polyester). This pattern is not suitable for very thin stretch fabrics. Project fabric packs containing all necessary materials can be ordered two weeks before the class, priced €15 to €25. Please ensure you contact us to order yours.